I’m always on the lookout for new flavor combinations and I think this one is worth sharing. Thai and Mexican dishes share many flavors: cilantro, lime, avocados, and of course, peppers. If your trying this on folks who are a little less adventurous, then be sure to stick to the flour tortillas, but eating this in cabbage leaves is more authentic and tastes great. You can make this vegetarian or include a bit of meat if you need to convince the carnivores in your house to give it a try. 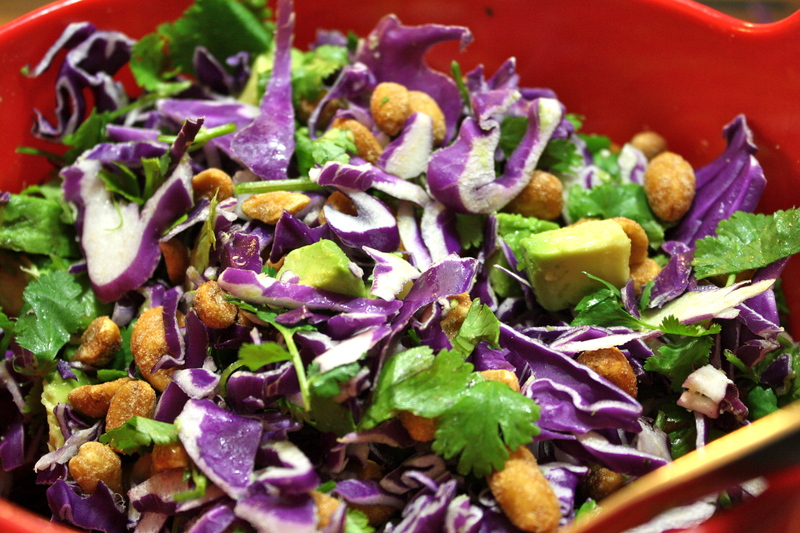 The roasted sweet potatoes and avocado play off the crunch of the cabbage and peanuts. Add a little spice and tang from the siracha and lime juice…. it just works! My son raised an eyebrow on me when I first said I was making this, but promised to be “open minded”. He ate 3 three of them (so I think it passes the test). The sweet potatoes roast quickly due to the small pieces, you can prepare the other veggies and sauce while they roast. This meal is ready in 45 minutes and is a nice change of pace. Great for weeknights. Preheat the oven to 400F. 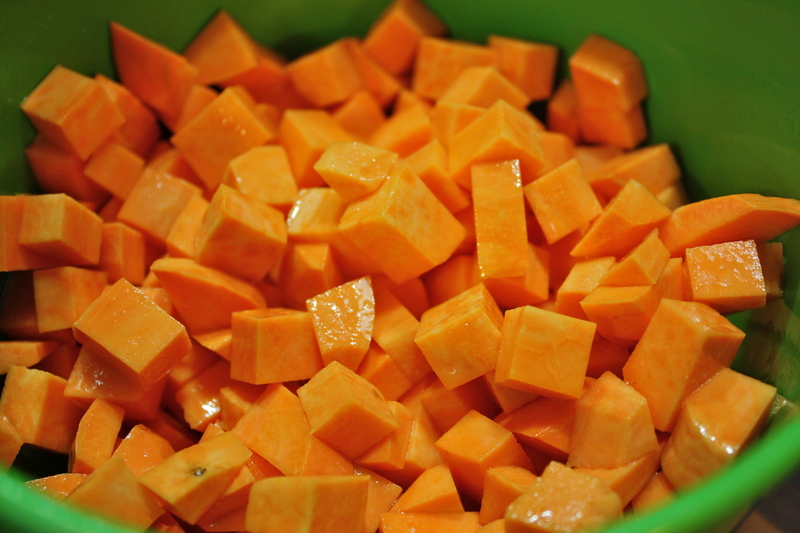 In a medium bowl, drizzle the sweet potatoes with the oil,add salt and pepper and mix. Place on a baking sheet lined with a silicon mat or parchment paper. Roast until lightly browned and tender. About 20 minutes or so. Remove and allow to cool. 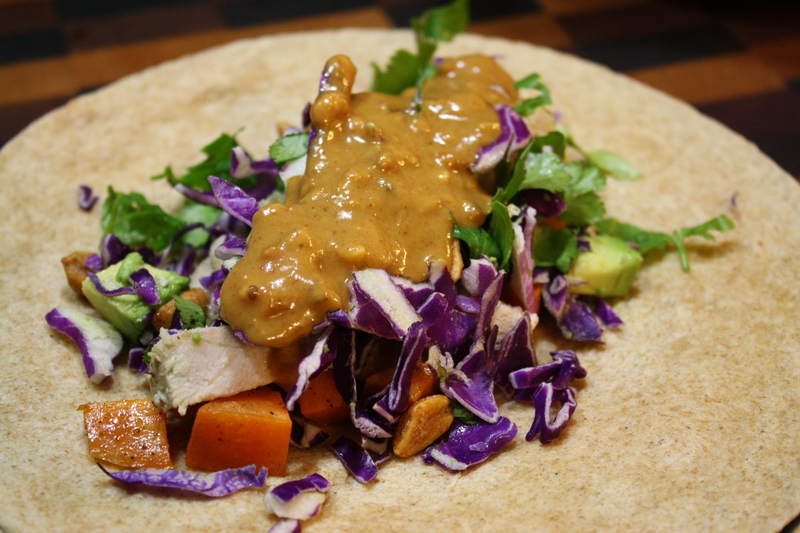 In a small bowl, whisk together the ingredients for the peanut sauce. Add Siracha to suit your taste, you want a bit a heat to help bring out all the flavors. In a large bowl combine the chopped veggies, peanuts and avocado. Warm up the pork for a minute or two in the microwave if using. 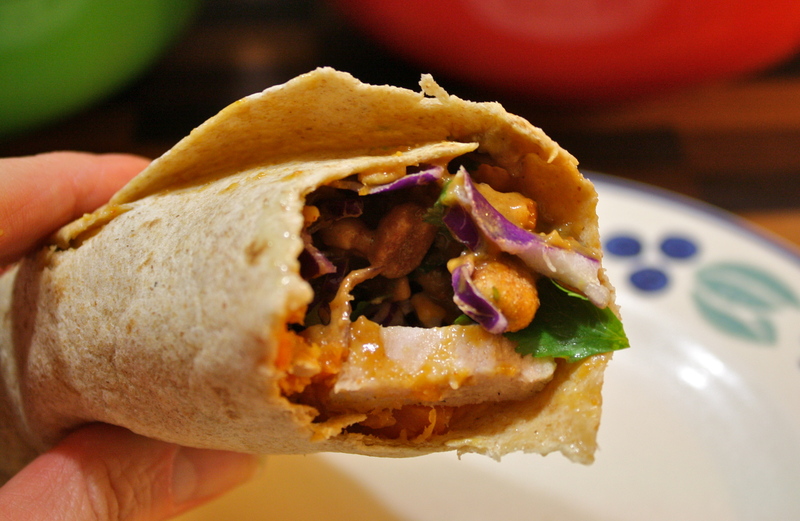 Assemble by dividing the chopped veggies and roasted sweet potatoes among the tortillas. If you want a bit more protein, a bit of cubed pork chops goes really well in this dish. 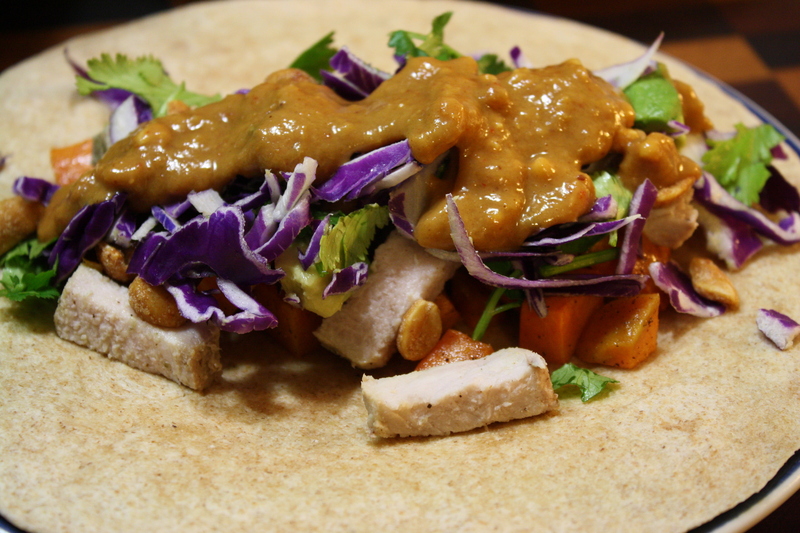 Add the peanut sauce of the top. Roll up and serve. I don’t usually like to eat veges that are colored purple but this certainly looks delicious. Glad to learn I’m helping you expand your palate! Looking completely delicious! As always!